goes beyond the jagged red cliffs, peaceful sandy beaches, and rolling green hills. It's more than impossibly-fresh seafood, creative artisans, and world-class golf. also realize that you've been welcomed into our hearts." 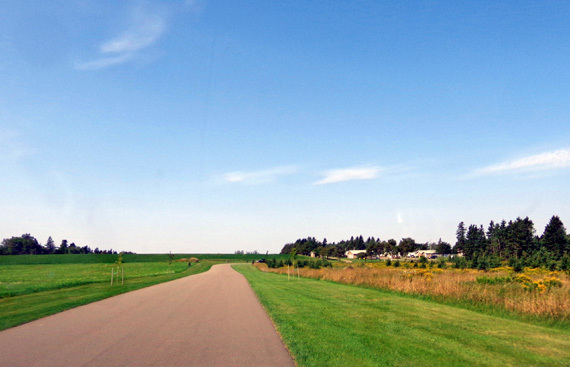 Another thing we read about while planning our trip to the Maritime provinces is what actually motivated us to spend a week on PEI -- the Confederation Trail hiking and biking path that traverses 174 miles of the island, part of the Trans-Canada Trail. I offered to crew Jim if he wanted to ride it in sections but he declined. We rode just part of it one day and found another scenic trail along the northern coast of the island in PEI National Park. 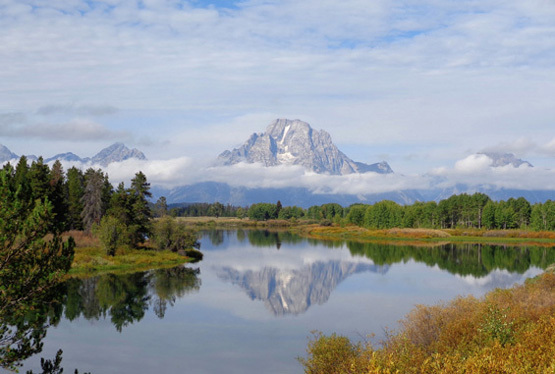 We researched the camping, cycling, and hiking opportunities on the island well before we picked up the colorful, comprehensive guide of other things to do and see at the visitor center when we first arrived. Unfortunately, we didn't adequately research the options for getting to the island as thoroughly as we should have. 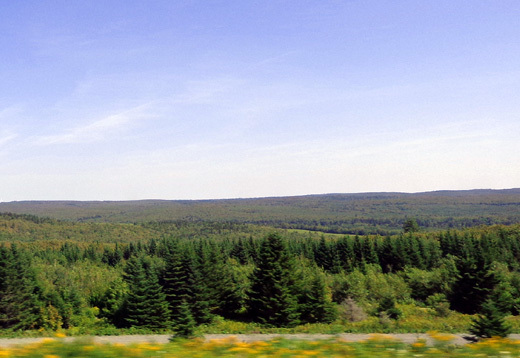 The drive from our campground on Digby Neck, Nova Scotia to Pine Hills RV Park north of Charlottetown, PEI was just 363 miles. We often drive that far or farther with the Cameo but we decided to split it up into two more leisurely days so we could take the "slow road" through the Annapolis Valley north of Digby. Turns out, we had plenty of time the first day to have driven the whole way to our next campground. We used the extra time to stock up on food and supplies at a Walmart in Truro, NS and got to Pine Hills early enough in the morning the second day to start enjoying the area. We ended up driving 273 miles the first day to Amherst, NS, close to the border with New Brunswick, then drove just 90 miles the second day to reach our campground via the very long Confederation Bridge across Northumberland Strait to the island. Our destination, Pine Hills RV Park, is marked with a red dot. 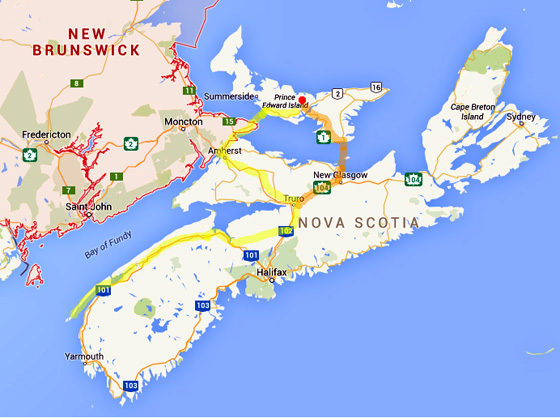 Our second "miscalculation" was taking that more western route to reach PEI. In retrospect, we could have saved some miles by going a more direct route to Pictou, NS and across the strait on the ferry to Woods Island, PEI. We knew that would be shorter but we incorrectly thought it would cost almost twice as much to take the ferry. The bridge toll is a hefty $60 CA for our truck-camper combo; the toll on the ferry is $111 CA (passenger vehicles are less for both). 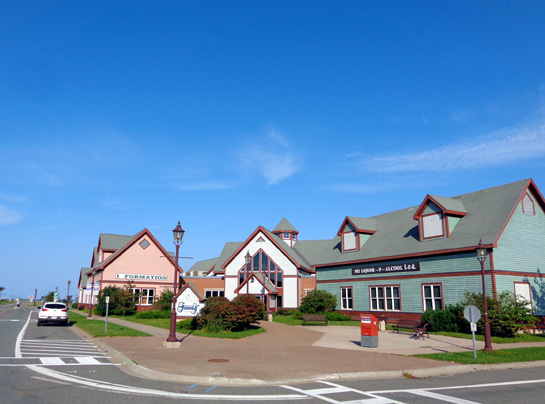 Turns out, there is no charge on either the ferry or the bridge to go TO Prince Edward Island. You only have to pay a toll to LEAVE the island! We didn't know that till we got over there. Fellow travelers, keep this in mind if you visit PEI. The downside is that we could have saved some miles and seen more territory if we'd driven to Pictou, NS, taken the ferry to PEI, and gone back to the mainland via the bridge at the end of the week. The upside is that we really liked the bridge and we didn't spend any more $$$ by driving over it twice. 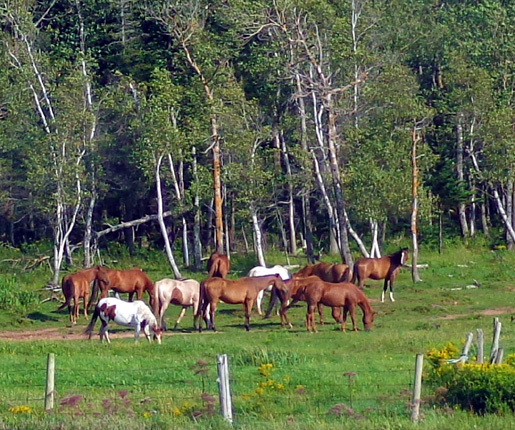 Other than that, we enjoyed our ride from Whale Cove CG to Pine Hills RV Park! Both days the weather was sunny and warmer than average (low 80s F.), much improved over a couple of other travel days we've had in the Maritimes. 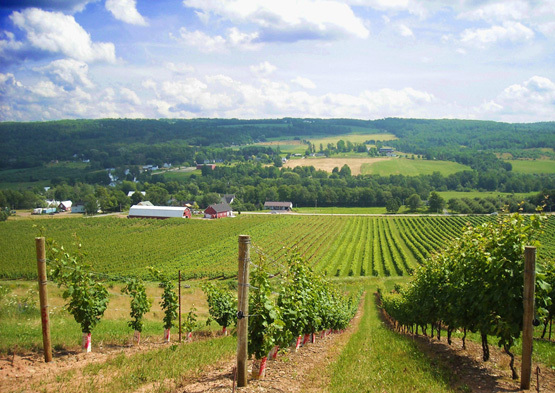 We loved all the farms, orchards, and vineyards we passed in the Annapolis Valley from Digby to Berwick along NS 1. 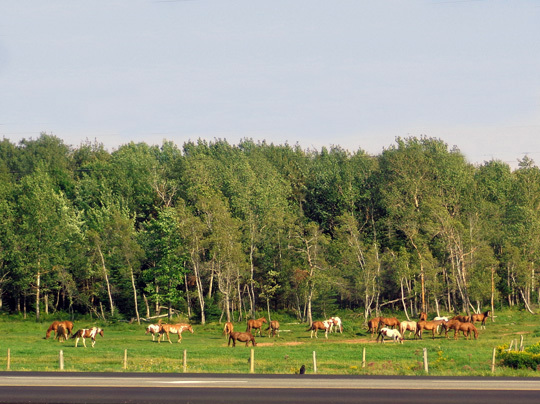 The Annapolis River is scenic and the whole valley is lush and fertile. After Berwick we got on NS 101, which is the Maritime version of a freeway. We used NS 14 as a tangent to NS 102, another freeway that took us to Truro, NS. We drove west on CA 104, also a freeway, to Amherst, where we parked overnight at the Walmart store. We got to Walmart early enough for Jim to go on a bike ride before supper. We parked next to a large grassy field where he could play ball with Casey. She also got to play with a chocolate Lab in another RV that was spending the night close to us. We had plenty of time that we could have gone on to Pine Hills RV Park a day early but we didn't. We wish now that we had. 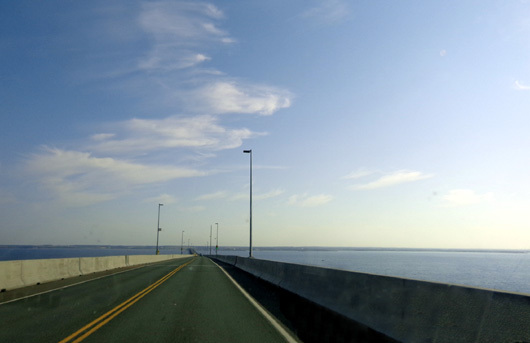 The second morning we took CA 16 through NE New Brunswick to the 8-mile-long Confederation Bridge across the water to PEI. If you do a Google search of the bridge and click on one of the images you'll be directed to a page with dozens of photos of the bridge. We're back to both English and French on signs; this one says no cell phone usage while driving. Water, water everywhere across the strait but on a sunny day you can see land at both ends of the bridge. 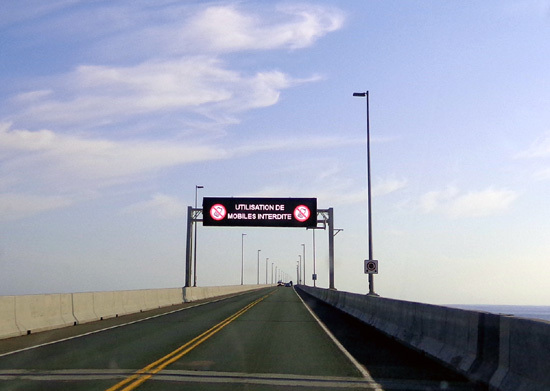 The Confederation Bridge is the longest in the world that spans a body of water that freezes over in the winter. It was built in the 1990s to replace a ferry in that location and opened in 1997. This bridge is the only vehicle link to the island during the winter and sometimes it closes if it gets iced over. The ferry at Pictou doesn't run in the wintertime when there are few to no visitors to the island and many residents have gone south to avoid the cold. The ferry can't get through anyway if the strait is a sheet of ice. Our bottom line: PEI is a lovely place to visit or live when the weather is nice, but not so hospitable or convenient in the winter! 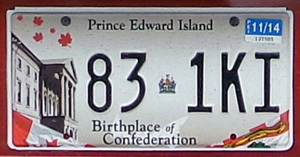 We'd see a lot of this word on the island because 2014 marks the 150th anniversary of the Charlottetown, PEI Conference. In 1864 the Fathers of Confederation met at Province House to discuss the formation of the nation of Canada. The province has numerous events and activities commemorating the anniversary. I'll talk more about some of them in another entry. After we got settled in at our campsite we spent a couple hours reading through the PEI guidebook and learning more about the cycling trails, etc. 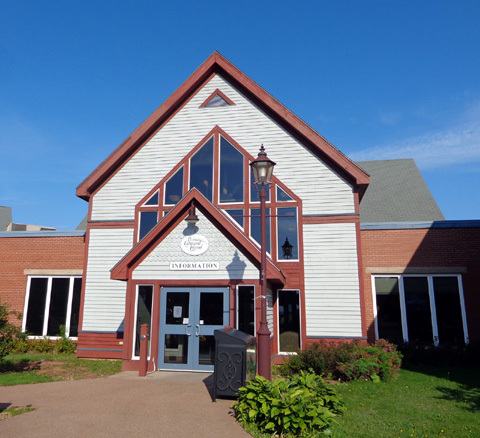 PEI is the smallest Canadian province in size (not population) but there are a lot of things to do and see that interest us. Once on PEI we had to override the GPS several times. 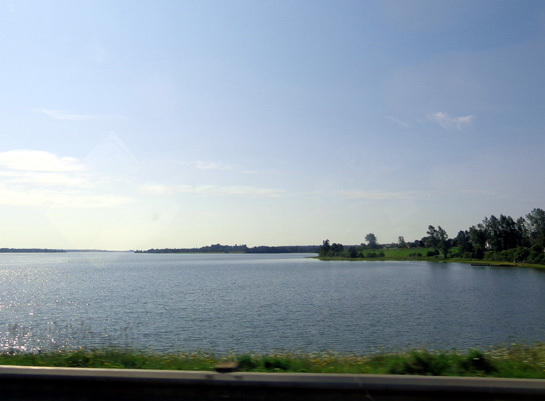 It kept directing us off CA 1 to little country roads that probably would have been shorter to the campground near Harrington, which is NW of Charlottetown (the capital of the province), but we stuck to more major roads with the Cameo. The roads we took were scenic. 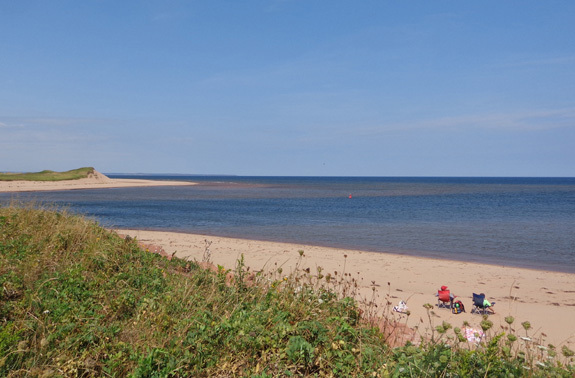 Like Nova Scotia, PEI is also known for its fertile valleys, lovely coastal views, and little fishing villages. We're looking forward to taking day trips all over the island to see what it has to offer. All the roads we took were good except parts of NS 217 on Digby Neck but that was the only way to get to and from Whale Cove in a vehicle. Our only complaint about the freeways in the Maritimes is the lack of rest areas like we have in the States. Perhaps that is so travelers will be forced to go into nearby towns?? The only real rest area we've seen so far up here is the one at Amherst, NS and it's better than most in the U.S. We stopped there again on our way to PEI, just because it's special. We followed the campground's directions rather than our GPS and found the place rather easily. It'll be our home base for the next week as we explore the island.